James Hunt won the USA Grand Prix at Watkins Glen, his second victory of the season, but Niki Lauda's fourth place was enough to clinch his second world championship. Hunt broke Lauda's lap record in practice but his delight was short lived as he piled his McLaren into catch fencing soon after as he tried to better his own time. His car was rebuilt in time for him to take pole from the Brabham of Hans-Joachim Stuck. Stuck was quickest off the line on a wet track, but John Watson's gamble on dry tyres spectacularly backfired as he dropped from third on the grid to last by the end of the first lap. 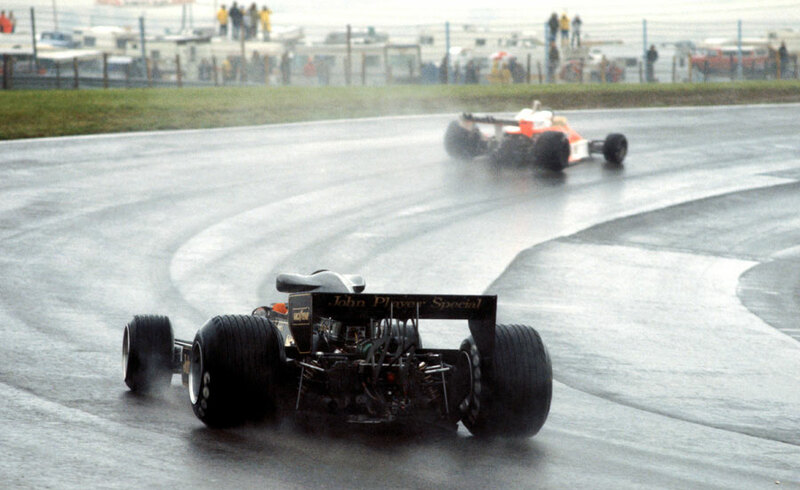 Stuck held on to his lead until he spun off on the 15th lap after his clutch failed, and that left Hunt leading from local favourite Mario Andretti, with Jody Scheckter, needing a win to keep his faint title hopes alive, in third. The order remained unchanged, and although the final margin was two seconds, Andretti clipped 12 seconds off the lead as Hunt eased off to conserve his wearing wet tyres. "My mirrors were all covered in mud and my pits did not tell me Mario was closing," Hunt said. Lauda, who had driven an uneventful race, finished almost two minutes back. Lauda's moment of glory was tarnished by a tawdry row within his team. Ferrari's chief mechanic, Ermano Cuoghi, who worked almost exclusively for Lauda, was absent from the pit wall. The team management had sought assurances from him he would not follow Lauda to Brabham the following season, and when they were not forthcoming he was sacked over the phone by Enzo Ferrari.